sweet, you're now on the heroes list! Thank you for registering for the PreSale! You will get 1st dibs and best selection before we open to the public on Friday! 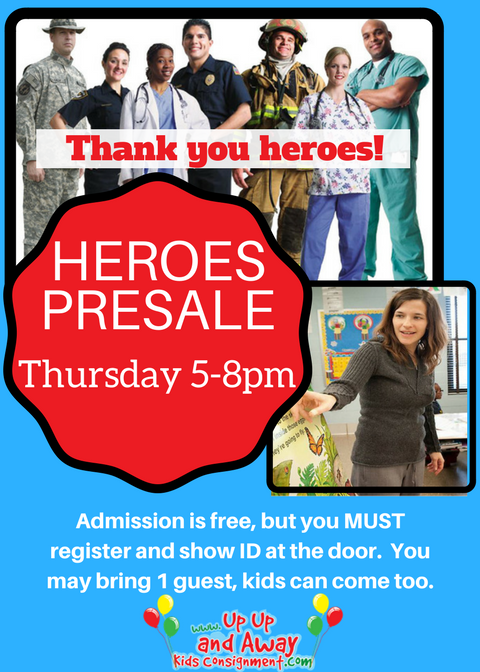 along with your Hero ID (or copy of your hero spouse's ID) for Thursday, JUNE 13th at 5:00pm for FREE entry! Each pass is good for 2 people. Kids can come too! YOU ARE A HERO TOO! YOU ARE COMING TO SHOP!